Bronze plaque with figures in relief commemorates the Victory at Waterloo, Belgium by Napoleon in 1815. Waterloo Sydney was named in commemoration of the victory. The Battle of Waterloo was fought on Sunday, 18 June 1815 near Waterloo in present-day Belgium, then part of the United Kingdom of the Netherlands. An Imperial French army under the command of Emperor Napoleon was defeated by combined armies of the Seventh Coalition, an Anglo-Allied army under the command of the Duke of Wellington combined with a Prussian army under the command of Gebhard von Blücher. It was the culminating battle of the Waterloo Campaign and Napoleon's last. The defeat at Waterloo put an end to Napoleon's rule as Emperor of the French and marked the end of his Hundred Days return from exile. 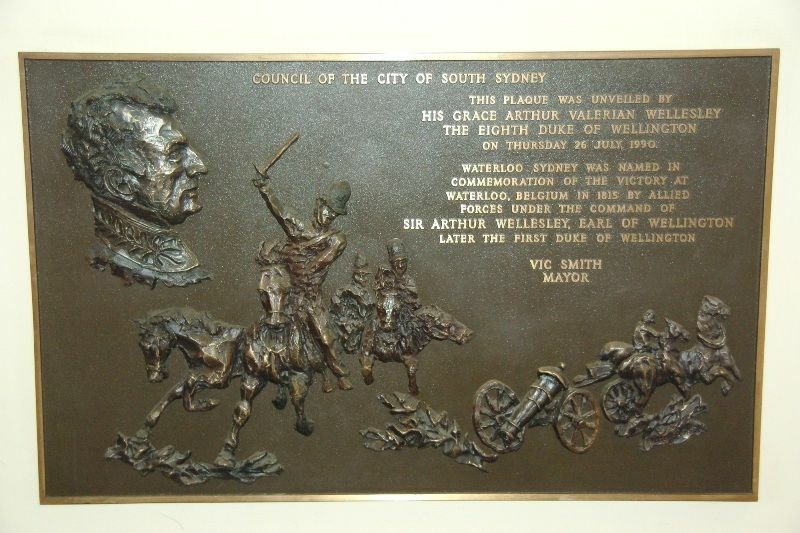 THIS PLAQUE WAS UNVEILED BY HIS GRACE ARTHUR VALERIAN WELLESLEY THE EIGHTH DUKE OF WELLINGTON ON THURSDAY 26 JULY, 1990.